Most popular in blood red. 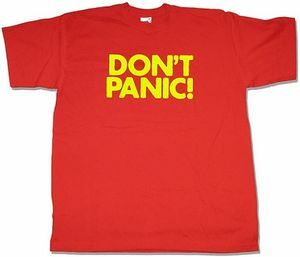 The 'Don't Panic' T shirt is an Artifact of great kudos. It instantly marks our Hero as a survivor of the Mini Quest Don’t panic. This Mini Quest is part of the series of Quests that end in fighting the Level Boss. 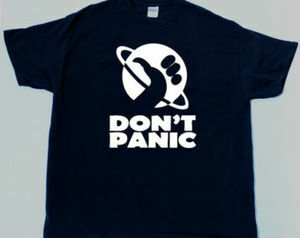 The Level Boss is a big bad boy, hence to great Kudos in obtaining this 'Don't Panic' T shirt Artifact. This wondrous T shirt is available in black for those Heroes who desire a bit more street cred and aren't too worried about the occasional blood stain or pasta sauce spillage. Also available in 'street cred black'. This page was last edited on 14 June 2015, at 07:11.